This is an update to the previous post about Dell's new ULPC. The realease date is set to be around the 22nd of August for $300 (around £160!). As soon as they are in the UK I am snagging one! PowerMac + Ubuntu = Server Time! While on holiday, I was helping my great-uncle out with his study room setup (I ended up saving him a switching of ISP!) and at the end he offered me a Mac that he bought in 2000, that he had replaced and therefore no longer used anymore. He was going to take it to the dump and so I gladly offered to take it back with me. 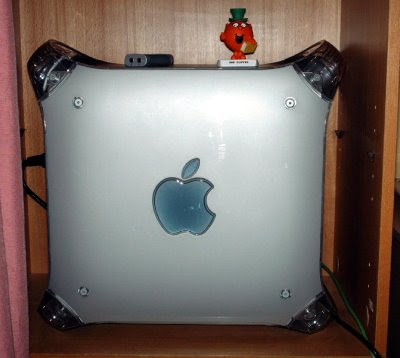 I took a look inside when back home, and found it was a PowerMac G4 with a 450Mhz PowerPC Processor and about 600mb of RAM (also with two 10GB hard drives). Just to make sure it all worked I fired up an Xubuntu LiveCD and was happy when I saw the familiar layout. Unfortunately, the Mac had just missed OSX and so when I booted from the HD was dissatisfied with the ugly UI that stood before me (I was expecting Aqua!). After a lot of thought (and disappointment that Apple had made the case so it couldn't be used again) I decided to transform it into a server! After a short while I had Ubuntu Server PowerPC installed and so I looked at trying to install OpenVZ (a virtualisation option for servers) so if anything went wrong, i still had my server, however after half a day of ploughing through poor PowerPC orientated documentation I took a step back and went to bed.